Dr. Henia Dakkak had scarcely reported for work at her new job when she received orders to go to Thailand in the wake of the massive tsunami on Dec. 26, 2004. She arrived at what turned out to be the sixth deadliest natural disaster in the history of the world to find bodies all over the place. There were long lines of men and boys waiting at aid stations to receive water and food but no women. 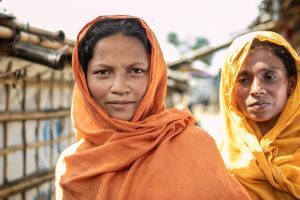 As the senior advisor for the Humanitarian and Fragile Contexts branch of UNFPA, the United Nations agency for reproductive health and rights, Dakkak is always looking out for women. But in this case she had to find them first. She found them hiding in makeshift shelters, sometimes just the shade of a tree, she told benefactors of the Family of Woman Film Festival Thursday morning. The women didn’t have the clothing—not even underwear and slippers–that they needed to go out and seek assistance. “They felt exposed,” she said. This sort of problem is often repeated in developing countries when women have their menstrual periods, she added. Many girls and women cannot afford supplies to take care of the situation and so they hide, often missing school. Simple items can make the difference between life and death for those in developing countries, particularly when it comes to newborn children and their mothers, Dakkak said. 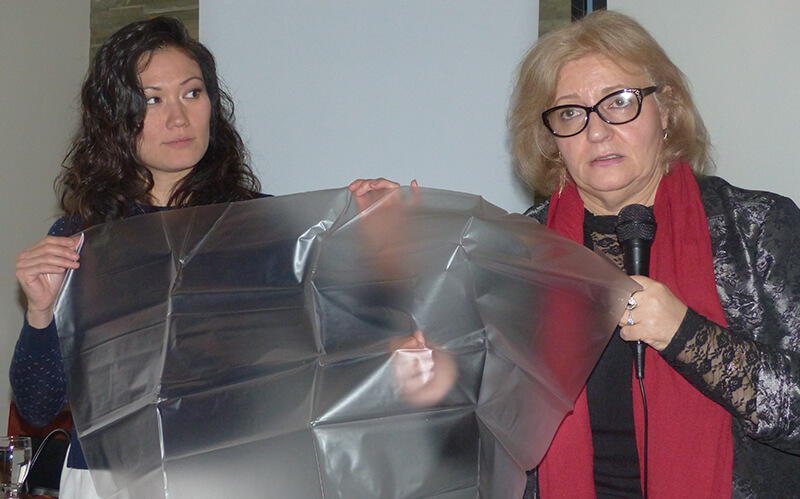 She pulled out a UNFPA delivery kit costing $7 that contained a plastic sheet and a couple simple tools. While in Nigeria following the Civil War, Dakkak said, she encountered a woman who had delivered twins on the road. A simple plastic sheet like that in the kit would have allowed the woman to lay down on something sanitary. The kit also contains a bar of soap that the woman attending to her could have washed her hands and plastic gloves in the event there was no water. The kit also contains a string to tie the umbilical cord and a razor to cut it. 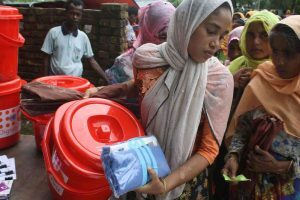 Help UNFPA provide women in humanitarian disasters with Clean Delivery Kits. UNFPA produces other bags containing things like scissors and stitching threads that it hands out to military hospitals in developing countries where doctors might be called on to perform a C-section. “The military hospitals are set up to deal with broken bones and trauma. 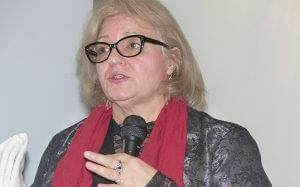 There’s nothing in the hospitals to deal with childbirth for the women who come to them seeking help,” Dakkak said. She produced another plastic bag containing a small fleece blanket. Dakkak said she and her fellow workers are seeing an increase in emergencies due to climate change. The conflict in Darfur, for instance, was thought to be an ethnic conflict but actually started with two groups fighting over scarce water resources due to climate change. Syria had drought for 10 years, forcing people to move from the farms to the cities where they had no jobs. And that contributed to its crisis. Among those listening in was Wendy Pesky, who has supported the Family of Woman Film Festival since its beginnings 12 years ago. “We’ve got to empower women if we want to make a change in the world,” she said. Evelyne Guindon, director of external relations for Women Deliver, said her organization is thrilled to be part of the Family of Woman Film Festival.